It’s official folks. 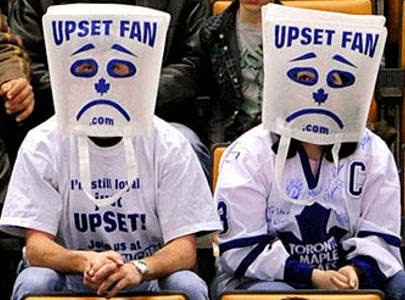 The Toronto Maple Leafs hockey club is officially the worst sports franchise in North America. ESPN ranked sports franchises according to a range of attributes including Affordability, Coaching, Fan Relations, Ownership Honesty, On-field Leadership, Stadium Experience, and Bang for the Buck. The Maple Leafs ranked 122 out of 122! They also scored dead last in affordability, ownership honesty and fan relations. A remarkable achievement, when you think of it. Toronto is arguably the heart of the hockey world. The Maple Leaf logo is iconic and goes back almost a century. The All Blacks, Bayern Munich, and the New York Yankees don’t always win, but they never shame their uniform. Are there any management and leadership lessons in the Maple Leafs sad decline? If you treat your customers with disrespect, you eventually lose your soul. Maple Leaf Sports and Entertainment (MLSE) are notoriously heartless ‘suits’. They regularly offend and abuse their fans by squeezing every last nickel out of ‘their asset’. Sadly, the addiction to hockey is so deep, demand is ‘inelastic’, as the suits would say. Insiders suggest MLSE’s cost-benefit analysis indicates they make more money when the team is bad. Purpose is more than just dollars and cents. MLSE evidently believes their Purpose is solely to increase shareholder value. Jack Welch calls this ‘the stupidest idea I’ve ever heard’. Can anyone imagine the All Blacks, Bayern Munich or any splendid sports organization taking such a position? Are fans, employees and the community not stakeholders? How long-lasting is financial success if you lose their respect and loyalty? I’m reminded of Toyota’s iconic logo – the three ovals. It’s significance was explained to me during my first week there. Is Maple Leaf Sports and Entertainment capable of improving? Or are they the bizarre exception that proves the laws of management and leadership? Financial collapse will take a long time. MLSE has a monopoly and Maple Leaf fans, (like NFL fans), are deeply addicted.